Dear all, this is going to be a long but interesting post, hang on there with me. As you may know I helped to create, keep on going, and improve the EJC Diabolo Battle https://www.facebook.com/EJCDiaboloBattle/. I received tons of love because of that, I am proud, and I will keep on going. Thanks to everybody for the help and for coming and enjoying it! Why I do these things? Well, it seems it makes me happy to know that diabolo evolves and expands around the world. This year I tried to convince the sponsors of the EJC Diabolo Battle to bring players to compete to Asia as an award in the EJC Diabolo Battle. So if you win the EJC Diabolo Battle you could go to Asia to compete. Unfortunately sponsors do not want to go by this, mostly because 'what happens if the winner is usually not using my diabolos?? ', which is a valid concern. Then in the EJC I learnt that Twin Spin already has traveled to Asia for a competition, and they actually won a medal in the Asia Diabolo Cup. This means the Asian Diabolo associations already have a structure and a plan and willingness to bring players from Europe to Asia. 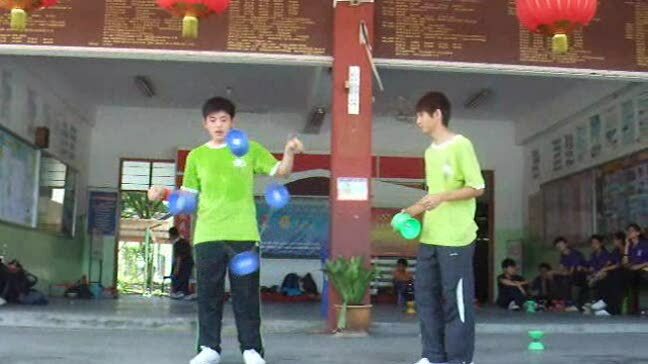 2- Motivate players to try to go to Asia to compete and so make the whole International Diabolo Community grow. - Make a calendar of worldwide competitions where foreigners are welcome and invited to join. So this is a declaration of intentions, feedback is welcome. Let us diabolo!! 3) Video clip Audition results will be announced on 17/9 and those who listed are eligible for registration for the War-D Tournament on 11/11. Video clip audition expires on 10/9 so hurry up & grab your chance! I will try to complete these, any feedback is welcome. I would like to give special thanks to the president of the Japan Diabolo Association, Tetsunori Saito. He seems to be a similar person to me, told me a lot of how the competitions look like in Asia, and his motivation is probably crucial for me to write this today. Saito, you are Awesome! I love it! Great to see your efforts in both the battle and now in trying to stimulate competition across borders. I don't know what else to say really, I personally don't think about taking part in competition (any more) but I do somehow find this interesting from a different perspective. Is there anything you need a hand with, any particular questions you have towards the community? Are you visiting any of these contests? So far I cannot think of a concrete question, but maybe we could have a call, a bit one day since you did not come to the EJC this year and we saw ourselves irremediably condemned to miss you. For the other people reading. Let us share some Asia related material. This is the best thing i have heard in a while. We have had many years of competition inside Finland, but as of late it has become really stagnant, maybe this would motivate and inspire the young 'uns and us old goats alike. We have the FDC coming, and this is definetly something that we will be discussing. Would this be open to Diaboloists from North America as well? In principle this is for everybody since my intention is that people from around the world travel and compete, meet and share. In principle Asia has already an established network, which may not be perfect but is the best in the world in terms of number of competitions, level of organization, and means. Then I am targeting first European players because they are closer to me, and maybe is a place where we can try to get some European funding. Then I would like to give also a big importance to Latin America since there are tons of good players there. So far my target is to let people now about the competitions, check who is interested and then maybe contact the organizers and see what is possible. I expect that players will need to make an important contribution for plane tickets but the goal is to try to reduce that as much as possible. Hi, I am Soon, diabolist from Malaysia. Your idea is good, so that would no boundary between us. Thank you for your answer Soon! I will update the original post with your information. In Finland We have Finnish Diabolo Association that organizes Finnish National Diabolo, Yo-Yo and Kendama contest every year since 2009 with Finnish Yo-Yo association and Sirkus Supiainen. Contest is open for everybody and you can win the contest but the highest ranking Finn get's the Finnish Champion title. Usually this event has happened in second week of July but this year We still haven't had the contest. I believe We'll have 2017 Contest during this year. At least I would hate a lot of skipping a year in a great event like this. Post updated with the Finnish National Diabolo rough information. Good luck, Samuli, I hope you will make it this year. And good luck in the tutorial competition, Soon! I know I started this topic, I am working on it, but it will take some time. Please be patient, and keep reasonable expectations. Next weekend I will go here, so if you are there, see you!! here's thing about Finnish nationals. Finnish national diabolo contest has been organized every year since 2009 and now 2017 We have the contest for the ninth time. 2017 contest will happen at Eräjärvi (same place where FDC-festival happens) 1.-3.12.2017 With yoyo and Kendama national contest. Feel free to join us then. Open World Wide! Prepare yourself, send your video! !